Welcome to The Hall of Blue Illumination, the podcast dedicated to the world of M.A.R. Barker’s Tékumel. 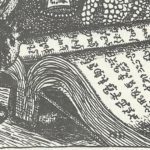 In this episode, our estimable hosts continue their discussion of The Book of Ebon Bindings. Points referenced include the significance (or the absence thereof) of humanity’s interest in the nature of the gods, the power of secret names, the existence of thieves and underworld communities, and ultimately, why a demon lord (and its evocators) might have good reason to fear an ancient planetary defense battery on one of Tékumel’s moons! [00:00:58] Before the episode started, our hosts discussed several starting points. Ultimately, rather than decide on one, they decided to discuss them in turn for us. [00:01:18] Victor begins by mentioning the excerpt from Pavár’s Scrolls, quoted by Tsémel Qurén hiKétkolel in the The Book of Ebon Bindings. (BEB p. 6). Pavár indicates that while some have pointed to humanity’s questioning nature as a sign of its superiority over other beings, it might also be said that this shows our limitations. [00:02:15] The cosmos doesn’t care if humans ask why, and even if it did, humanity couldn’t understand the answer. It’s almost Lovecraftian. [00:02:37] It’s a healthy reminder that looking for the “why” of things in Tékumel is fraught with peril. [00:02:56] Often in roleplaying games, people say they want verisimilitude, but they really also want predictability. Yet the real world isn’t predictable, and doesn’t necessarily make sense. [00:04:10] James wonders if this doesn’t reflect players’ desire to understand the world so that they can “game” it, rather than blindly stumble their way through. [00:05:50] The gods are the gods. You can’t expect to fathom their ways. [00:06:10] Tékumel (the setting) predates the game. Scott notes that the world of Tékumel reminds him of the ancient world, where everything was much more mysterious and less settled. [00:06:59] Tékumel is very alien to us, even the humans who live there. Modern people in the real world generally aren’t used to looking at things in the same way the Tekumeláni do. [00:07:30] It’s much more “anthropological.” Players want to operate out of a rational mindset, but these societies are more traditional and culturally static. [00:09:44] The day-to-day experiences of most people in the Five Empires is rather mundane and routine. But adventures exist beyond the pale, and this situation doesn’t always apply to them. [00:11:02] Anyone down for a session of “Tékumel – Papers and Paychecks, Adventures in Tsolyáni Accounting”? [00:12:49] Where does one receive their secret name? Good question. Victor speculates that a secret name is something taken up by the sorcerously-inclined. It may be something one discovers when he or she ascends to a certain level of the priesthood. [00:13:27] Secret names aren’t often discussed in game Tékumel, but they seem incredibly important from Tsémel Qurén hiKétkolel’s discussion of them. [00:14:24] Of course, demon summoning isn’t something done lightly. [00:14:41] If a practitioner wanted to summon a demon in a game, a plot point might revolve around discovering one’s secret name. [00:15:00] Different temples would certainly have very different rituals related to the revelation of one’s secret name. [00:15:46] Scott suggests a secret name-related adventure hook – an entity fools a human into thinking that his or her secret name is something it isn’t, in order to control that human. [00:16:30] As an aside, Victor poses a question: are there thieves on Tékumel? Namely, individuals who act in a fashion that would be ignoble to the majority of society, but noble to themselves? [00:17:01] Scott suggests that they might be found in a foreigner’s quarter, but in any case there wouldn’t be a community organized around thieving. [00:17:26] James says that obviously there are people who steal things, but that there aren’t “thieves” in the D&D sense on Tékumel. [00:17:41] Victor notes the cardinal’s words further down (BEB pp. 11-12 1978 ed. ; pp. 10-11 1991 ed.) about the importance of mental discipline in magic, which concludes with a comparison to a “thief of Jakálla,” and notes their “proverbial” artistry. [00:19:18] Does this contradict the Professor’s statements elsewhere? James suggests those indicate that thieving isn’t a “vocation,” or something that an individual would assume in the same fashion as a profession. [00:19:52] Victor suggests that there are cutpurses, burglars, tomb robbers, etc. and many places where a criminal underworld could exist, but not in the same organized sense of D&D-style thieves guilds. [00:21:24] Of course, the penalties for thievery and the like are rather extreme. [00:21:43] The Tsolyáni do have prisons, even if most social transgressions are solved either with a payment of shámtla on the one end, or impalement on the other. Both the map of Jakálla and Man of Gold reference imperial prisons. Jakálla has a prison specifically designated for debtors and indigents. [00:23:00] Back to The Book of Ebon Bindings, James tries to recall a demon whose summoning involved the position of one of the moons of Tékumel. Victor, as usual, knows exact who he’s talking about: Jnéksha’a (BEB p. 45 1991 ed.). James brings it up because the Book explains why he cannot be summoned while the moon Kashi is visible – Jnéksha’a fears it, because the demon Tkél lives there. [00:24:24] Upon further discussion, James suggest he was recalling someone else, some demon who couldn’t be summoned when one of the moons of Tékumel was in a certain position because of ancient planetary defenses still in place there. Victor recalls this as well, and says that in his experience, attempts to summon Jnéksha’a while Kashi is visible result in a fantastic bolt of energy descending upon the evocator and his surrounding area from the sky. [00:27:57] Victor says this is a reason for interrogating those who played before he did, who will probably know more. The great general Kárin Missúm perhaps? [00:29:30] Scott compares the different layers of Tékumel to mixing different layers in music. [00:32:20] There are references throughout the Tékumel corpus to the other bodies of Tékumel’s star system being inhabited. [00:33:02] The demons are rather sophisticated in their understanding of the cosmos, magic and technology. Scott recalls an interaction in Prince of Skulls. [00:33:42] The demon races are basically intelligent beings from some other plane of reality. [00:37:16] The Book of Ebon Bindings is a good example of how Professor Barker was comfortable making other people uncomfortable. Victor gives an example of this where a player failed to take human sacrifice seriously, so Professor Barker focused in on it. [00:41:47] Tékumel was never designed to be a commercial product available to an ever-growing audience. In some ways, it’s a reaction to D&D’s attempts to appeal to the public at large, and the concessions made as a result. “The Blue Room” was a Tékumel-focused ftp site formerly hosted by Chris Davis, one that saw regular contributions from Professor Barker. An archive of this material is available here. Prince of Skulls, Professor Barker’s fourth novel, remains out-of-print. It was originally published by Zottola Publishing in 2002, and currently, can only be obtained at significant cost from third-party resellers. The Tékumel Foundation plans to reissue it in print and electronic versions in the future. Cults of Prax was published in 1979 by Chaosium. It’s a supplement for RuneQuest. Prof. Barker’s review appeared in Gryphon Magazine #1 (1980).